In honor of Moldova, let’s clear out the weeds. Let’s make room for a garden. A springy, happy sort of place where you can go to daydream in the morning sunlight, with a cup of steaming hot tea at the ready.NOTE: Most authentic recipes call for tomato juice mixed with a spoonful or two of vinegar on the bottom of you casserole pan. Instead I opted for a plain tomato sauce to add textural oomph, but the choice is yours. Also, if you use large zucchini you might need to make more stuffing than I did – just double the recipe (leftovers will be great on rice). 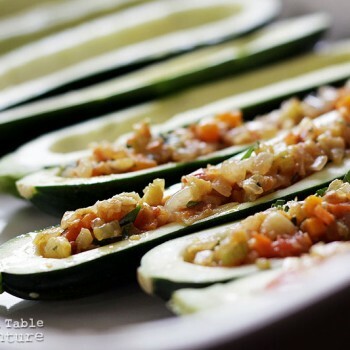 Simply slice the zucchini in half lengthwise and scoop out a channel of the white flesh. Chop this last. Add the chopped zucchini bits, celery, carrot, onion, and tomato to a skillet with a pool of golden olive oil, salt and pepper. Cook until softened and beginning to brown (and the entire house smells like “good”). Remove from heat and sprinkle on the parsley, to taste. Preheat the oven to 400F. 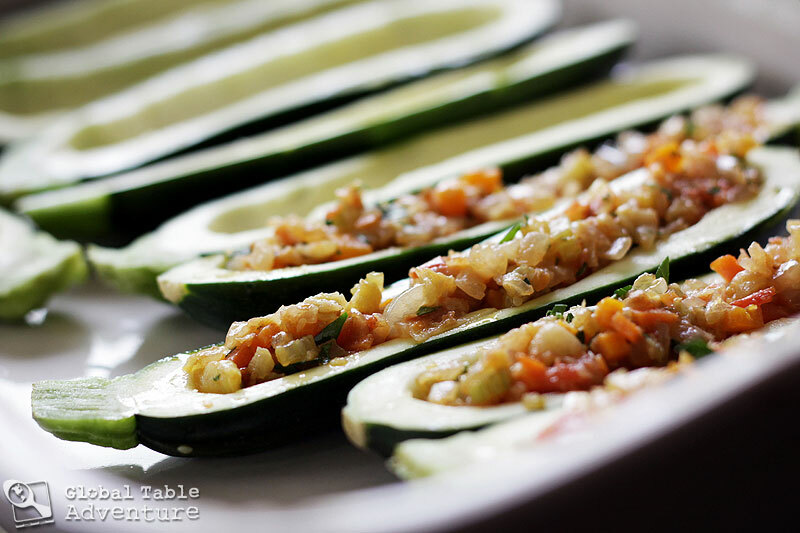 Meanwhile, stuff the zucchini dream boats with the filling. When you’re done, nestle them on a bed of tomato sauce and top with cheese. Bake for 25 minutes, or until softened, but the zucchini still retains its shape and has a little bite.